I will discuss as a VT CNC Programmer the important basic steps in setting up work on a CNC slant bed turret lathe for a chucking operation with machined soft jaws. These basic steps make it possible to have a high degree of confidence the job being set up will run trouble free and consistent after the setup has been completed. The focus of this example will be the setup of the tooling and work holding for the machine tool, not the program or different methods of teaching tool geometries. The assumption in this example is that the operator will have a simple tool list of common outside diameter tooling, inside diameter tooling, and a drill to install on the machin e. The responsibilities the operator will undertake performing the set up are: installing the tooling, toolholders, machining the work holding and processing the 1st piece, before turning the job over to an operator who will run production. The first step is reviewing the tool sheet and gathering the specified tooling, soft jaws, and stock to be machined. While gathering the materials to set the job up, visually inspect the tooling you are going to use. When inspecting the outside diameter (OD) and inside diameter (ID) turning tool holders, check for dings or dents on the tool holder shank that have created a deformity or raised surfaces from the ding on the tool holder. Small dings and deformities may cause issues with the machining of the workpiece because the deformity may cause the tool to be off center with the spindle centerline during installation at the machine. Having a tool off center can cause premature tool wear, poor finishes and difficulty holding tight tolerances consistently. If your tooling has small dings on the shanks, take a small stone or flat file and run it over the area with the ding until it is flush with the existing surface on the tool shank. When selecting tool holders such as collets and bushings for the ID tooling, check for chips and dings in or on the collet or bushing. Make sure they are clean and free of damage. 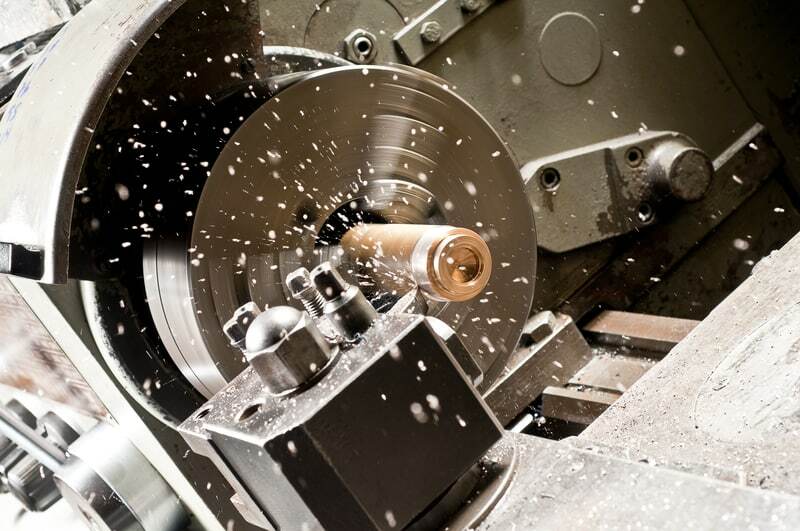 If the collets or bushings have chips or dings they may cause tooling to be off center and/or not parallel with the spindle centerline after installation in the machine and during machining. This can cause relatively the same issues as above, however, it may also cause issues during drilling, reaming, or tapping, such as bell mouthed or oversized holes. Taking the few seconds to visually inspect you tooling before assembling and installing it on the machine will reduce variables caused by problems with the work piece during machining, such as short tool life, or poor finishes. After gathering and inspecting the tooling, including the tooling for boring jaws, start working on the work holding portion of the machining process. Work holding on a lathe is a very critical piece of the process for a robust and repeatable machining process. As a VT CNC Programmer, if the work holding is not correct it can cause issues with the geometry of the workpiece, such as tri-lobing, runout, and taper; it can also cause safety issues, such as the work piece coming loose in the machine. When preparing the soft jaws for gripping the work piece you do not need a program to machine the jaws, however having a program does make it easier. We will focus on the jaw configuration basics rather than the actual method of machining the jaws. When starting the work holding process, first visually inspect the work piece that needs to be machined. Make sure there are no burrs on the diameter that will be gripped by the jaws. Next visually inspect the soft jaws you are going to be using for burrs and or deformities. If the jaws are in good condition check for numbers on the jaws such as 1, 2, or 3. If there are no numbers on the jaws, use a set of numbered metal stamps and stamp the jaws, numbering each jaw sequentially by the number of jaws you will be installing on the lathe chuck. Install the jaws on the chuck using the numbers on the jaws to match the numbers on the master jaws of the chuck. The reason for numbering the jaws and installing them to the matching master jaws is for future use after the jaws have been machined and removed for the next job to be set up. Having jaws numbered and installing them in the same positions by matching the numbers stamped in the jaws and the numbers on the master jaws will reduce the amount of work with the jaw preparations in the future setups. Make sure you follow your chuck manufacturer’s safety procedures for installing the jaws on the machine. Safety needs will be determined by the type of chuck you have on your machine. You may have an air-chuck, hydraulic chuck or scroll chuck on the machine. The type of master jaws come in different configurations from tongue and groove to serrations; each chuck assembly could be different. Make sure you follow the chuck manufacturer’s safety procedures for your chuck. Install the jaws on the machine, making sure they are equally spaced on the chuck in respect to the spindle center line. You can check this out visually with a scale, calipers, or by gripping a slug and turning the chuck at a low rpm. If you turn the chuck at a slow rpm you will visually see if one of the jaws is out further than the others. During the machining of the jaws we want to make sure we machine the correct configuration for the work piece. The jaws should have an under cut at the intersect of the gripping diameter and the bottom or shoulder of the jaws. The undercut will make sure that the part is held correctly on the gripping diameter and against the banking surface of the jaws when clamped. If you do not have an under cut in the jaws the work piece may be pushed out away from the banking surface of the jaws or cocked in the jaws from the radius of the turn tool used to machine the jaws. The radius from the turn tool left in the corner of the jaws, will prevent the chuck from clamping correctly on the work piece. If the work piece is to be gripped on the OD we want to make the bore of the jaws slightly smaller than the work piece diameter. If the jaws are going to be gripping on the ID of the work piece we want to make the jaws slightly larger than the ID we will be gripping on. The reason for making the jaws in this way is to increase the gripping surface area of the work piece. For example, if we are using a 3-jaw chuck to grip the OD of a part we want to create a 6-point chucking grip by machining the jaws slightly under sized from the diameter to be gripped by the jaws. If the jaws are machined oversize even a slight amount the 6 points of contact will be lost and the jaws will only be gripping with three points of contact. The more surface area we have for the gripping of the work piece the better the work holding setup. When jaws are machined correctly the part will be held with greater rigidity and the machined workpieces will be more uniform and consistent quality when machining multiple parts. Use a set of tri-micrometer to check the size of the jaws as they are machined if possible or use the work piece itself as a functional gage when checking the size of the jaws. After the jaws have been machined to the correct configuration, make sure you remove the small burrs created by machining the jaws. Removing these small burrs are not only for safety reasons but also to make sure no small burrs are introduced into the clamping of a work piece. A small hanging burr can accidentally be clamped between the work piece and the jaws, creating marks on the work piece and tolerance issues when machining the work piece. Taking the time to correctly configure your jaws will remove another set of variables that can cause a job to run poorly and possible create scrap or rework. After the work holding process has been completed, install the tooling in the machine. Like all the other processes first visually inspect the mating surfaces of the tool stations and tool holder blocks. Check the mating surfaces for similar issues like chips burrs, and surfaces blemishes. We want to check for these issues because even small defects to our set up will reduce the integrity of our machining environment and reduce the success of the set up or production process. While installing your tooling on the machine you may want to check a couple of items with an indicator, to make sure the tooling will be properly set in the machine. If you are using a drill, reamer, or tap, use an indicator and gage pin to check for concentricity and parallelism by mounting the indicator on the chuck and moving the tool station to the spindle center line. Use the gage pin in place of the reamer, drill, or tap. When the tool station is moved into position take the indicator and place it on the gage pin, rotate the spindle by hand with the indicator attached and check for concentricity to the spindle centerline, after checking for concentricity. Check for parallelism by traversing the carriage to run the indicator along the gage pin, rotate the indicator 90 degrees and repeat the check for parallelism to the center line. These checks take a couple of minutes, however a couple of minutes here can save many minutes of troubleshooting when a hole feature is not being machined to specification, or tool life is less than optimal. After the tools have been installed, the offsets, tool geometries, and work shifts are set it is time to make chips. Turn the single block function at the machine control on while having control of the machine with the manual overrides, single block up the first tool in the program to the tools approach point. Use the position page to make sure the tool is approaching correctly and the distance is correct. After the tool has completed the approach move correctly turn on the optional stop function of the machine’s control. After each tool has run through its cycle the program will stop at the optional stop in the program with the optional stop function on and programmed optional stop codes. After the machine has stopped at the optional stop it is important to visually inspect the part before proceeding to the next tool. You should make a visual inspection of the work piece. Look at the finish for any signs of gouges, or other visual indicators you can make as a baseline for the tool’s performance. Also check the size of the machined features to see if they meet specification or if there is material left for other tool processes within the program for finishing tool paths. Making these checks will give you knowledge of what each tool is doing throughout the process. This will help understand the cause and effect of the remaining tool paths. When these small parts of the process are overlooked during the set up it is like running the job blind, because the finishing tools will cover up issues by removing the previous tool’s machining characteristics. If each step of the process is checked at the end of each tool and before proceeding with the next tool you will have a baseline to gauge and compare the future performance of that tool. When the machining process has been completed check the work piece visually and with metrology equipment in the machine before taking it out of the jaws. By checking the part in the machine before removing it, you may catch tolerance issues or visual characteristics that can be re-machined, saving the part rather than scrapping it or having to rework it later. Then if the part is visually and geometrically good, remove it from the machine and perform the inspection outside the machine. Compare the results from your in-machine inspection to the out of machine inspection. If the sizes or geometry of the work piece are different from when you checked it in the machine you may have an issue with the work holding. If the work holding procedure was completed correctly it may be a chuck pressure issue that needs small adjustment. If the part passes inspection and the program, offsets are correct and the previous basic tasks of the set-up have been performed, the job will most likely be a well running problem-free job for the production run.